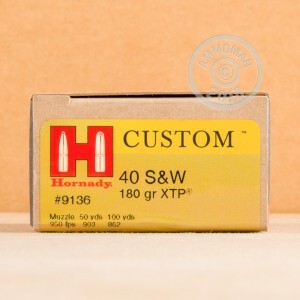 This ammo from Hornady is a top-quality defensive load for .40 S&W pistols. It fires a medium weight 180 grain jacketed hollow point XTP bullet at a muzzle velocity of about 950 feet per second. The XTP bullet is known for its dependable penetration and ability to incapacitate assailants quickly via expansion in critical locations. 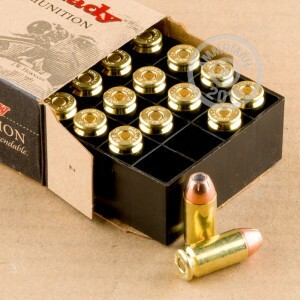 This 200-round case (containing 10 boxes of 20 rounds each) is perfect for testing and training your carry load. 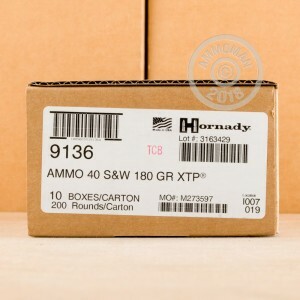 While hand-inspected premium ammo doesn't come cheap, AmmoMan.com is here to help with free shipping for all orders over $99!